Teach your child to ride Bicycling in a different approach! Learning how to ride a bike is one of the biggest accomplishments in a young child's life. As a parent, you have the responsibility to teach your child to ride correctly and safely. It is also important to keep the learning process fun and free from pressure. It's much easier than the old way of doing it (running behind or along side your child and pushing her) is an outdated and undue punishment for both you and the frustrated Child. A punishment for you, the parent, because you quickly run out of breath (you're not the sprinter you used to be in high school), and a punishment for your child because he doesn't understand why on earth she crashes every time you're getting tired and release your grip of his saddle. He realizes that learning to balance is a scary and stressing ordeal. In a different approach ,kids aged 4 to 6 can easily and quickly learn to independently ride without training wheels and without an adult gripping their saddle from behind. The technique described here is much safer than the old one and has a much higher rate of success, based on the experience of many happy children who learned to ride this way. A balance bicycle can be a great tool to help your child learn how to ride a bicycle correctly. 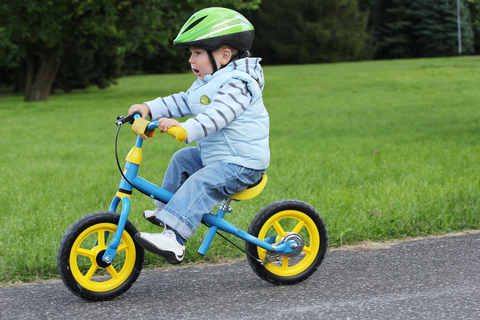 The purpose of a balance bike is to help the child learn proper balance and steering. A balance bicycle does not have pedals, gears or a crank set and chain. There are also no training wheels on a balance bicycle. Balance bicycle are great beginner bicycles, and they can be used by very young children. Select the Right bicycle: It it important to buy a balance bicycle in the correct size. Your child should be able to walk with both feet flat on the ground while sitting in the seat of their balance bicycle. After walking with the balance bicycle for awhile, your child will learn how to cruise and steer his bicycle. This is how it works: Remove the training wheels and remove the pedals from your child's bicycle. Lower the saddle so your child can easily place both his feet on the ground while seated. From this point on, your young child takes full control. He is in charge of moving the bicycle, with no help from you, with no pushing or balancing on your part (unless she asks for it). You can compare the bicycle with no pedals to a two-wheel scooter, which kids love and enjoy riding and balancing with no fear. A word on children's capabilities: It may come as a surprise, but little children do have good instincts and common sense which translate into self esteem and confidence it they get a chance to use them. In the old way, the child is taught to rely on someone else to balance the bicycle, and not on himself. The adult was the one who controlled the situation, the movement, the speed. The adult was the one preventing crashes and providing a false sense of safety which crashed when he let go. This erodes trust and makes the experience scary. With the suggested technique, your young child is the one making the calls. He determines how fast he goes, he is the one moving and balancing, and controlling the bicycle from the get go, he is the one preventing the crash by simply placing her feet on the ground. This builds trust. Trust in his capabilities. This builds self esteem and confidence. You explain to your child that all he has to do is create a little movement ahead while balancing. You tell him that he can't fall, because the minute something doesn't feel right, he can always put her feet down on the ground (which is the starting position) and brake. he has to try and hold him feet in the air a little while and keep pushing this way. You choose flat ground (no slopes), no vehicles, and no obstacles. You can also take his to the park and find a grassy field, so if he does crash, it's a softer landing. Long pants are advisable, to prevent scratches when falling. Use this opportunity to teach your child to wear a helmet, so he can get used to it. After just a couple of lessons your child will get the hang of it. Now he feels the balance, and he masters the first and very important skill of balancing. You can now replace the pedals, move the saddle up an inch, so her feet comfortably reach the ground, but not as easily as before. Next, choose a grassy field with a gentle slope, and let your child go down the slope, balancing with his feet on the pedals. After a few runs, he will feel comfortable and add pedaling. It's important you explain to his in advance how to apply the brakes. At this point all you have to do is behold the magic: your child enthusiastically pedals and just can't get enough! Many parents say that after years of painful failures, their child finally gets the hang of riding a bicycle with this technique.